Yamadera Fuga no Kuni (山寺風雅の国) is shopping district located right next to Yamadera. 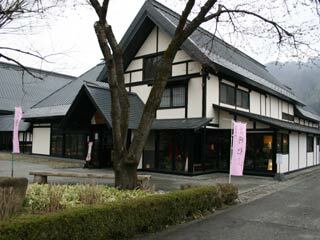 There are the museum of Matsuo Basho, art gallery, gifts shops, sweet cafe and restaurant. Ennin san is the famous rice cake in Fuga no Kuni. At the gift shop, there are all kinds of Yamagata Products. The restaurant of Fuga no Kuni has great view of Yamadera. In Spring, you can see also beautiful Sakura and Yamadera at the same time. They have traditional "Shojin Ryori" the vegetarian food for monks. Ennin-san is their original sweets. It is a rice cake with sweet been and maccha and sakura flavored. There is beautiful garden which has great view of Yamadera and other nature.